Hab 1:12-2:4 O God, why do you gaze on the faithless in silence while the wicked devour the just? Shall they keep slaying without mercy? The Lord answered: The vision will be fulfilled and won't disappoint. Wait; it won't be late. The rash have no integrity, but the just, because of their faith, shall live. Ps 9:8-13 "You forsake not those who seek you, O Lord." You govern and judge with justice. You are a stronghold for the oppressed. Praise the Lord and proclaim his deeds; he heard the cry of the poor. #PrayForPeace: "Please take a moment today to pray for all those who have been forced from their homes in Iraq." One Bread One Body: Waiting for God's plan to unfold is hard, but the Lord keeps his promise though some consider it delay (2 Pt 3:9). "Wait; it won't be late" (Hab 2:3). We must wait patiently and confidently, not complaining, thus renewing our strength (Is 40:31), in which Hebrew 'wait'/'hope' can mean 'twist together' as intertwined cords). In waiting we're intertwined with the Lord; when forces pull at us, we like rope strands are pulled more tightly together and grow stronger, not "coming to the end of our rope." Passionist: St. Teresa Benedicta of the Cross, philosopher, close to family, lost univ. position because of gender and Jewishness, was killed because of her opposition to German war effort. Her final The Science of the Cross prefigured her martyrdom. "Mustard seed" faith will do much. May her prayers, and those of St. Teresa of Avila who inspired her conversion, help us to face the Cross with faith. DailyScripture.net: There are times we disappoint or fail. Jesus' response to the disciples, stern as it seems, is tempered with compassion. Jesus' rebukes the evil spirit and tells his disciples that with faith they can 'remove mountains' (Jewish phrase for removing difficulties). If we pray with faith, God will help us overcome obstacles. Universalis: St. Teresa Benedicta of the Cross; her order moved her to keep her safe from the Nazis. In retaliation for Dutch Bishops’ condemnation of Nazi racism, all Jewish converts to Christianity were ordered arrested; she was taken to Auschwitz and killed. 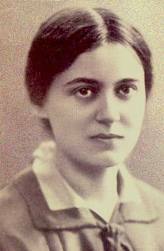 See Edith Stein, Apostate Saint on related issues for Jews and Christians; see also Wikipedia. "Fr. Chris's corner," about yesterday's 1st reading but after yesterday's 1st post: Is the Nineveh annihilated in Nahum the same one God favored in Jonah? See Nahum on Nineveh: Whatever Happened to Jonah? For the Jonah/Nahum timeline, see here and here.